Sure, he calls Seattle home now, but 28-year-old chef Brian Cartenuto — whose menu has been wowing ’em here in the Emerald City at Cantinetta — is getting plenty of good press in his hometown, as I read in this week’s dispatch from Florida’s Emerald Coast. Turns out Brian’s doing the James Beard mambo, blowing out of Seattle next week to cook at the James Beard House, as so many terrific Seattle chefs have done before him. According to the story out of Niceville, the chef comes from a line of restaurant-savvy individuals. His brother owns a couple of Niceville businesses, including Joey Tomato’s Deli and Little Joe’s. His folks work at his brothers’ restaurant. And (here’s my favorite part of the story) the Seattle chef had another vocation in mind before attending culinary school and launching a cross-country cooking career: he planned to become a priest. 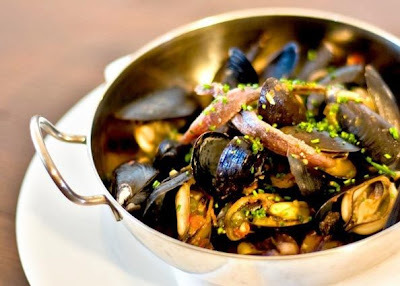 I’m a big fan, as I confessed to Cartenuto (and his amiable boss, front-man Trevor Greenwood) after a quick bite at Cantinetta, which has become my defacto pit-stop when I’m showing friends from out of town what a great Seattle neighborhood-restaurant looks like. That’s the second time in recent weeks I’ve ended up at the bar at Cantinetta, entertaining out-of-towners, sipping a mean Negroni and sharing a cataplana filled with fresh mussels. Hey! Jo and Larry! Why don’t you quit that frozen wasteland and move down here and open a nice little neighborhood restaurant? We’ve done it before (“lee-ly? no kidding. high crass”) and we can do it again! As if that little taste of Italy in Wallingford wasn’t enough, afterward, my pals and I headed to Capitol Hill and a trio of bar stools at the counter at Spinasse. There we shared some serious lovage, including this half of our antipasto misto della casa (a $28 taste of everything on 29-year-old chef Jason Stratton’s antipasti menu). 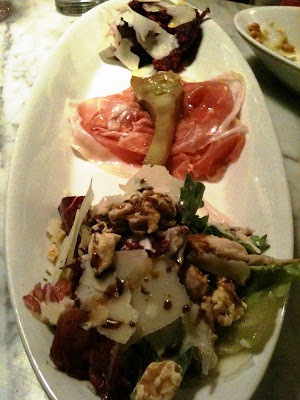 Order the antipasto mista della casa and you’ll get six tastes from Spinasse’s menu on two separate platters. This impressive trio, from foreground: insalata di cicoria (mixed chicories with rabbit and walnuts); prosciutto di Parma (with poached baby artichoke); insalata di barbabietole e uovo (beets, egg, pecorino).